The Oboz crew is made up of a couple of old school tele skiers, a kayaker who can claim first descent down the Ocoee, a former NOLS instructor that's familiar with going weeks without bathing, and an obsessed climber turned avid biker. This odd bunch managed to connect throughout the decades of being in the outdoor industry and decided to join up in 2007 to start Oboz. Combine the words "outside" and "Bozeman" and you´ve got "Oboz". Moreover, you've got something that speaks volumes about the company and their priorities. Outside is where their heads are, dreaming of the next peak to climb or river to float. And Bozeman, Montana is where they live, play, and of course, work on making Oboz the best shoes out there. Bozeman is one of the great places to enjoy and be inspired by the outdoors. Oboz is not just two words combined, but a way of thinking, living and doing that defines the company, the shoes and the people who wear them. 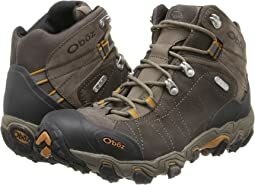 The phrase "True to the Trail" is the motto at Oboz. 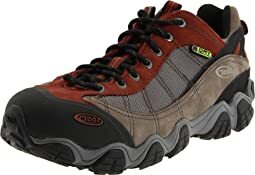 Oboz shoes are designed to be used on the trail to help people get into the wilderness - shoes for trail running, hiking, backpacking, approaching crags, scrambling and general exploration of wild places. The folks at Oboz are passionate about these activities. When they aren't talking about shoes at the office, they’re probably discussing the snow conditions up at Bridger Bowl or their latest adventure on their bikes. Looking to protect their favorite getaways, Oboz tries to minimize their carbon footprint and support organizations and causes that improve the state of the environment. This review is NOT intended for hikers! I am a 62 year old female, I suffer from severe pronation and have flat feet. I don't where these boots for hiking but everyday use to just get around. 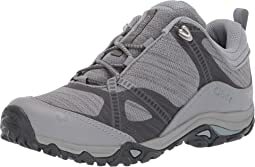 My other boots are Merrell's ,with those I have to add a pair of "SuperFeet" at and average costs of 40-55 $ This is my second pair of Oboz, these are a half a size bigger. This is the FRIST and ONLY pair of boots where no other insert is needed ! You need only to put them on and go. 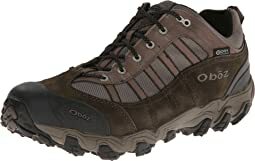 Thank You Oboz you have truly made my walking world more comfortable. "Move because you can. " Shoe was much too narrow. Oboz Sawtooth Low, too low for me! I thought I ordered the regular after reading review but these are indeed too low across the metatarsals for me to wear. Otherwise they would be a keeper, fit true to size. Was looking for something different from my usual Ariat but these won't work for me! These shoes felt great for about the first 15 minutes of walking around my house, but after awhile I could really tell how stiff they are. The whole shoe felt stiff including the tongue which started to press into my foot after a while. I bought them to take to Europe with me for walking on cobbles, but I am returning them, as I think the stiffness would bother my feet. First time for Oboz. 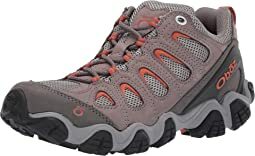 Taking them hiking to Scotland and Maine.. the tread feels aggressively the house but should be fine outside. I’m normally a 9 wide but Zappo suggestion was the correct sizing. Love these! I slipped it on and immediately felt like it was made for my feet. I had my heart set on a different style of Oboz because they were lighter and lower, but these felt so good on I can't give them up. My feet are fairly average but just different enougn that it's been hard to find a great fit. I have a slightly wide toe area, a slight narrow heel, with a medium arch. So glad I discovered Oboz as these fit as if it'd been tweaked in all the right places. 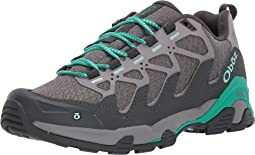 I now have 3 pairs of hikers (Tall - Vasque Breeze; Medium - Oboz Sawtooth; and Low - Ahnu Sugerpine), and even though I haven't hiked in these yet I feel they will be great. I also tried on Keens Targhee (in a smaller size), and while they fit well in the toe box my heels were swimming. The Keens are a tiny bit lighter at .8 lb instead of .9 lb for the Oboz, but the Oboz is much more supportive, and the lacing is higher up which hits the top of the foot at a more natural place. The tongue is soft and sits just right in its place. I also like that the styling is simple and very uncomplicated. It does look like a big shoe though, but I promise it doesn't feel that way. I am normally either 7 or 7.5, and for Oboz I would go with the larger. 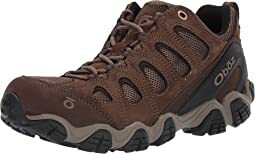 My husband tried these shoes on in a size 14 regular width at REI. REI didn't have them in a 14 wide in their store or on their website, so I ordered them here. 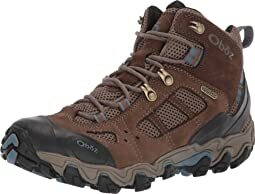 I missed out on the 20% off REI coupon, but there aren't many waterproof light hikers available in 14 wide, he is very pleased with this purchase. I was looking fo a sturdy outdoor slip on with an aggressive sole for working on the property. These fit the profile. I would not wear them as an every day casual shoe. They provide good support but are not what most people think of as comfy. Excellent shoes right out off the box. No breaking is necessary. Very comfortable and nice looking pair of shoes. They could be use for hiking and casual wear. I love the Oboz Sawtooth style shoe. It is very stable and has a wide toe box. They are very comfortable. I wear orthotics in my shoes and there is no problem with your heel slipping out of the shoe. My only complaint would be the shoelaces which will not stay tied. Even a double knot eventually comes undone. I have to use a device on the laces to keep them from coming untied. Other than the laces, I love these comfortable shoes. The quality and style are very good, but the boot is small and narrow. I couldn't even get my foot inside the boot, so you have to order a full size larger. Sent back the 8 1/2, too big. Will try size 8. I like the look, very wide toe box which works great for me. Enough room for my high arch too. These fit me fine with thin socks, but I want them for colder weather so I'm returning and will probably purchase a larger pair to try later in the year. They had terrific support. I chose to keep a different pair of shoes, but I had to really consider what I needed. I would have kept these if it were closer to fall/winter. I would have preferred one of the women’s style sandal (thus the 4 stars on style) but alas I wear a ladies 12 and this size is not available in the ladies. I also wear a narrow to medium width in ladies so when I purchase men’s shoes they are usually too wide, however in these sandals the width fits me fine, sigh of relief. I wore them on a short hike with my dogs and my feet feel great. The road is gravel and I was concerned about pebbles getting inside the sandal, didn’t happen, great foot protection. 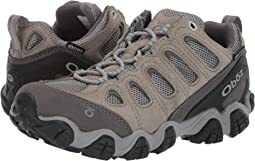 I have oboz hiking shoes and they also provide great support though I’m finding them a bit heavy which can lead to fatigue in my knees, so the light weight of these sandals is perfect for reducing strain on the knees. This is my 5th pair of these Oboz Sawtooth boots! I have been wearing them for 3 years and absolutely love them! They have been all over the back country and to Peru with me. They are good to go right out of the box. I have wide feet and arthritis on my right big toe and these give my feet room but not so much that they rub. They are secure and cozy on my feet. The heel is so supportive and very shock absorbing. I have tried Keens but I ended up with pain in my heels and achilles tendon, I get none of that with these. My legs wear out way before my feet do. I even wear these instead of tennis shoes for my power walks because they are so supportive. I had a hip replacement last year and these were what I recovered in and I have not used any other shoe since. I buy two at a time because I want to make sure I have them around in case they stop making them. I hope to God they don't stop this model of Oboz. They are simply the best! 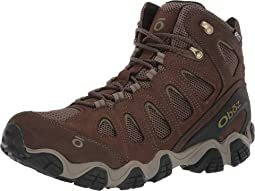 For those of us with a wide forefoot, this boot has been suggested as having a narrower heel than the Keen Targhee II. I loved the fit of this shoe except the most important part - the forefoot. The toe-taper puts too much pressure on my MTP joint. Going to try a pair of Altra trail runners (Superior 4.0) that have more give in the upper than my altra Lone Peaks. But man if they didn’t taper the toe box on these Obozes, I’d buy three pair! I’ve had the shoes a week. They seem to be good material overall. 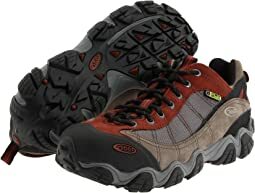 I have another pair of the fire red color hiking Firebrand 11 shoes. Great shoes! I like the feeling of a solid foundation and goid alignment with the Oboz Sawtooth II. 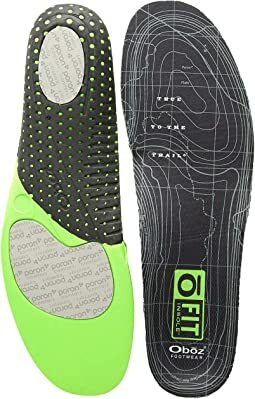 However they feel surprisingly stiff and hard, for all the fabric, and there is a point on each foot where a bunch of seams converge and hit a boney prominence in an uncomfortable spot. I have tried these in a shoe store and they felt like buttah, but I did not like the color the store had. So I ordered these. Some may say they just need breaking in. However my feeling is that unless they feel great out of the box, better not to count on it. 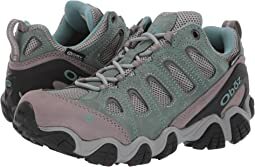 Unfortunately I think these will be going back, which is a pain because I have a terrible time finding shoes that meet my neefs for support. I thought these would be it, even though I really dislike wearing athletic shoes as my everyday shoes. But my go-to brands have yielded nothing but disappointment over the last year. Nothing seems to be made the way it was, twn or twenty years ago. I have never seen such an o erwhelming trend of useless garbage for sale as new in my life. I don’t know what has happened. But I am loathe to buy it. That said, these Oboz look like a great product, and it says they are hand made. It is just unfortunate about where those seams hit. Everything on the shoe feels like it hold up well. 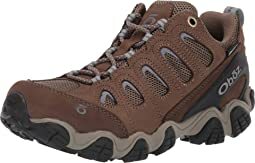 I have searched and searched for a hiking shoe with good support for my high arches - Success at last! Really like the subtle colors and style. 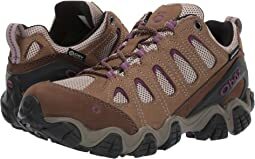 I’m wearing these for light hiking and outdoor activities and I find them exactly what I was looking for. Comfortable from the start, true to size and good on light trails. Feet stayed dry in a moderate downpour (shoes not billed as waterproof) while companions had wet feet/socks. I’m pleased. 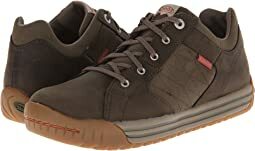 I tried three pairs of Keens (meh to these could work), and one Anhu/Teva (nope), and these. These won hands down. 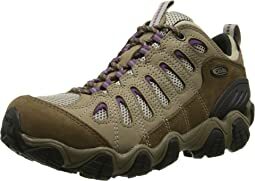 They had the comfort that I have in my old Anhu hikers, and feel both secure and roomy enough at the same time. It's off to England with my new friendz O and Bo. 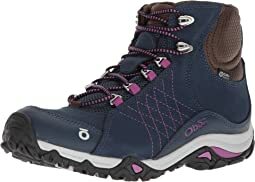 I run between a women's shoe size 9 and 9.5, so based on previous reviews stating that the boots run a bit narrow, I opted for the 9.5. The 9.5 boots fit perfectly and allow enough room for thick winter socks. With that said, my feet are on the narrow side of normal, so if your feet run a bit wide you may not be able to wear these boots with thick socks, or may need to go a 1/2 or full size up. 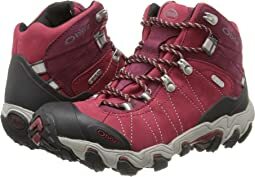 In addition to fitting well, the boots are comfortable, great in the snow and have decent traction. My feet tend to get cold easily, but these boots have kept my feet warm and dry even after hour + walks in the snow and rain. 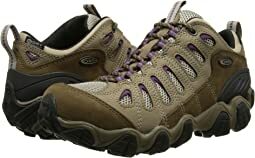 Unlike other hiking boots I've had in the past, these have a slim profile which helps me feel "surer" on my feet. Highly recommend! I have owned this shoe for over one year now and love them. 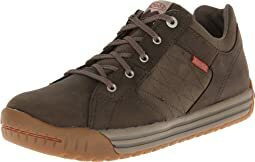 I wear them when I travel because the thick sole is comfortable to walk long distances and the shoe itself is very comfortable. The only issue I’ve had is the top, around the ankle, tore using a metal shoehorn. It may have been my fault but it seemed to tear easily. I still love the shoes, I’m a big guy and these shoes are perfect for me.